The speech act made by the U.S. and Israel has been a tremendous effective instrument in convincing the world that the ambition of Iran of acquiring nuclear energy is capable to become an existential threat to the West Asian region and to the whole world that adhered to the concept of peaceful coexistence. It is in this regard that the proponent had scrutinized how the U.S. and Israel securitized Iran’s nuclear issue as a threat to world’s geopolitical stability. 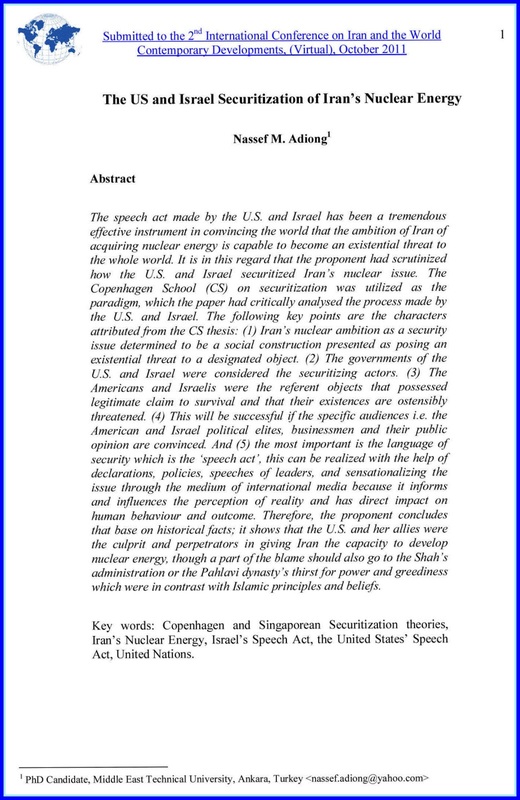 The Copenhagen School (CS) on securitization was utilized as the paradigm, which the paper had critically analyzed the process made by the U.S. and Israel. The following key points are the characters attributed from the CS thesis cognizant of this study: (1) Iran’s nuclear ambition as the security determined to be a social construction about the survival of the nuclear issue presented as posing an existential threat to a designated object. It is securitized when articulated by securitizing actor(s). (2) The governments of the U.S. and Israel were considered the securitizing actors. (3) The Americans and Israelis were the referent objects that possessed legitimate claim to survival and that their existences are ostensibly threatened. (4) This will be successful if the specific audiences i.e. the American and Israel political elites, businessmen and their public opinions are convinced. And (5) the most important is the language of security which is the ‘speech act’, this can be realized with the help of declarations, policies, speeches of leaders, and sensationalizing the issue through the medium of international media because it informs and influences the perception of reality and has direct impact on human behavior and outcome. 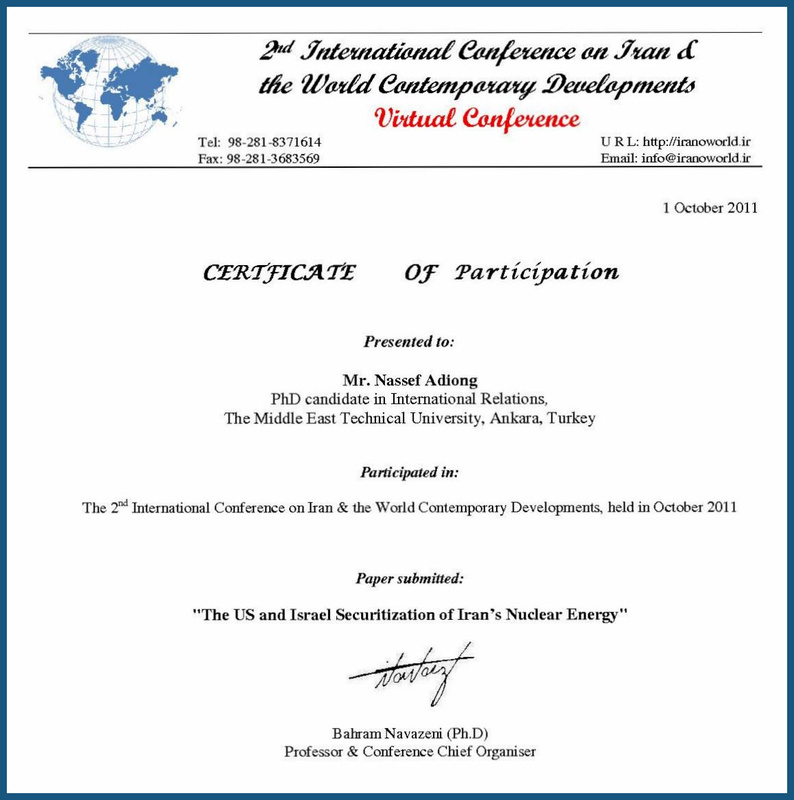 Consequently, the CS provided a framework to determine how and by whom a specific matter becomes a security, thus this study will explicitly shows what are the extraordinary actions which the U.S. and Israel have responded based on their asserted claims that Iran’s nuclear ambition is an existential threat in the Middle Eastern region and to the world per se. Therefore, the proponent concludes that base on historical facts; it shows that the U.S. and her allies were the culprit and perpetrators in giving Iran the capacity to develop nuclear energy, though a part of the blame should also go to the Shah’s administration or the Pahlavi dynasty’s thirst for power and greediness which were in contrast with Islamic principles and beliefs. Buzan, Barry and Wæver, Ole (1998) Liberalism and Security: The Contradictions of the Liberal Leviathan. Paper prepared for the Copenhagen Peace Research Institute.